With Westminster City Council still refusing to scrap their much hated motorcycle parking charge, the No To Bike Parking Tax protestors have been gridlocking Central London every single day for the last week with a lot more to come. 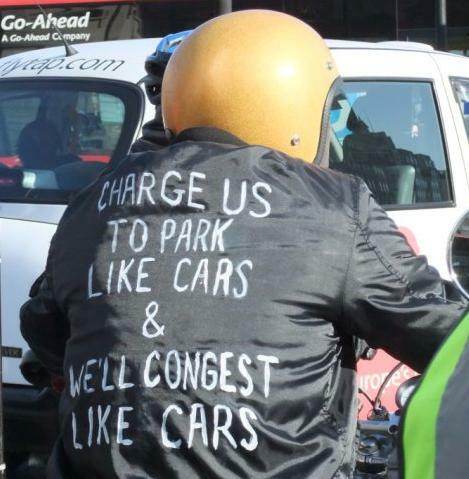 The bikers gather every weekday morning at 7.30am and cause enormous chaos on the roads until at least 9.30am, thus severely delaying thousands of commuters during their journey to work. On Wednesdays, the angry bikers not only protest in the morning, but also in the evening, while the same commuters travel back home from work. 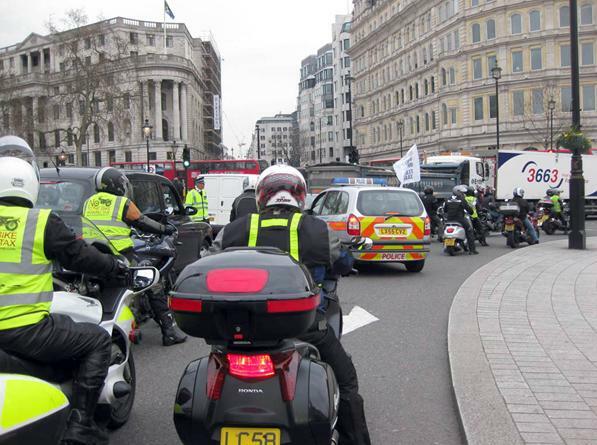 These demonstrations used to take place on Wednesday mornings only, but with Westminster City Council still ignoring the democratic right of UK citizens and residents to protest, the bikers have decided to gridlock Central London every day, until the council finally scraps its controversial bike parking tax. Last week was very bad in Central London for thousands of commuters forced to find alternative routes to get to work. Many of them got stuck in traffic for hours or had to commute via much longer routes, or else leave their home much earlier than as usual to avoid the traffic chaos caused by the bikers. And this week, it’s going to be the same again with Central London brought to a standstill every day. These daily protests clearly demonstrate that bikes are the transport solution for London. While thousands of cars, lorries and buses stay stuck in traffic for hours without being able to move by even one centimetre, the bikers seem to be the only ones who can quickly escape from the mess and still get to work on time. They leave behind them hours of chaos while they still arrive at work on time and cause no issues to their employers. So why should the bikers stop protesting? To the contrary, the huge mayhem that they cause every day seems to be the only effective way to force the authorities to take action and scrap the bike parking tax, if they don’t want to see Central London in a complete mess every single day for weeks and months to come. The number of bikes attending the protests keep increasing day after day, with more and more gridlock being achieved as a result. By legally riding their bikes as if they were driving cars, and leaving plenty of space between them as cars do, protestors bring the roads in Central London to a complete halt. There is no rule or law that forces bikers to filter through traffic, so nothing prevents them from riding their motorbikes or scooters in the same way as driving cars, and that’s exactly what they do in order to cause traffic chaos everywhere. “They want us to park like cars so we’ll behave like cars”, explain the bikers when asked why they keep blocking Central London every day. The protests have been very well covered by the press this week, as concerns about their impact on the London economy keep rising. By threatening the bikers to close access to bus lanes (currently open to motorcyclists to reduce the number of accidents and save lives) if they don’t stop their protests immediately, the Conservative Mayor of London, Boris Johnson, whose behaviour has proved to be very anti-democratic on this occasion, has achieved massive press coverage of the events and made the bikers decide to come back this week to cause some more chaos on the roads. 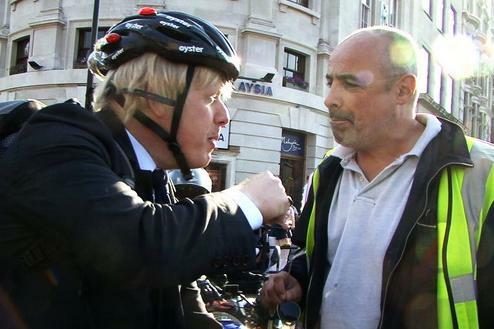 Johnson probably hadn’t realised that he was being filmed while threatening the bikers and he should have definitely kept his big mouth shut and not expressed his frustration openly in public. With the No To Bike Parking Tax campaign taking Westminster City Council to the High Court on 24th June 2010 and a massive ride-out on the London Orbital (M25 motorway) scheduled to take place on 19th June 2010 with thousands of motorcyclists expected to attend, time has never been so hectic for the council. And all this because Conservative lead Westminster City Council has failed to listen to thousands of citizens for the last two years, who have simply exercised their legal right to protest. The bike parking tax, other than being totally controversial and a money-grabbing scheme, is proving to be a very embarrassing and expensive initiative. I saw the footage of the chairman of the NTBPT trying to engage with Mayor Boris about the WESC & the threat to close those bus lanes open to P2W’s. Apart from the threat, I was appalled that the Mayor wouldn’t take the time to talk to Warren properly – in fact he didn’t break step. I don’t know where he was raised but his lack of courtesy reveals a serious omission in his upbringing. I may be incorrect here but does anyone else think it strange that Boris Johnson has never called a meeting with Warren.